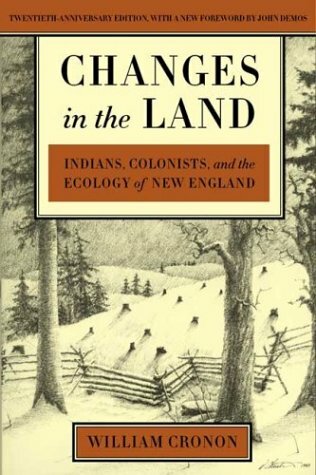 William Cronon’s Changes in the Land: Indians, Colonists, and the Ecology of New England interprets and analyzes the changing circumstances in New England’s plant and animal communities that occurred with the shift from Indian to European dominance. In his thesis Cronon claims, “the shift from Indian to European dominance in New England entailed important changes—well known to historians—in the ways these peoples organized their lives, but it also involved fundamental reorganizations—less well known to historians—in the region’s plant and animal communities” (Cronon xv). As the distant world and inhabitants of Europe were gradually introduced to North America’s ecosystem, the boundaries between the two were blurred. Cronon uses a variety of evidence to explain the circumstances that led to the dramatic ecological consequences following European contact with New England. Cronon often used records and reports in addition to scientific data as evidence for his arguments. Court records, town hall records, descriptions by travelers, surveyor records, etcetera proved invaluable to Cronon’s arguments. Nevertheless, the low ecological education level and the European bias of the historical records’ writers often restricted the reports. Additionally, some reports contained a deliberate bias that attempted to make the colonies seem more appealing to outsiders. Europeans viewed the land from an economic lens and tended to focus upon “merchantable commodities”, ignoring economically insignificant aspects of nature. In addition to human records, scientific data such a relict stands of trees and fossil pollen add pieces to ecological picture that Cronon aims to shape. Even though much of the data has flaws, as a whole it forms the ecological picture of New England. According to Cronon, the environment the Europeans first encountered in New England shocked them. Early descriptions were restricted to the coastline, but the accounts all agreed on the astounding level of animal and plant life in New England. The settlers were not used to so much untamed land, as landscape for hunting in England was reserved to large landowners and the Crown. Heavy forests covered the New England terrain, which was also new to the settlers, as England had exhausted most of its timber as fuel. European settlers were struck by the absence of domesticated animals, which played a vital role in European agriculture. The cycle of the seasons and the relative climate of the area remained the same as that of England. Also of note, 70,000-100,000 Indians were already settled in the New England area in 1600, a striking number considering that even by 1700 New England still contained only 93,000 Europeans inhabitants. The European settlers and the Indians had different values on life and had differing opinions on how they should use the land around them. According to Cronon, “Many European visitors were struck by what seemed to them the poverty of Indians who lived in the midst of a landscape endowed so astonishingly with abundance” (Cronon 33). To understand why a dramatic shift in the ecosystem occurred, it is important to understand the different practices between the North American inhabitants and their European aggressors. Indian communities exploited the seasonal diversity of their environment by practicing mobility. Their houses were portable, and they owned only belongings that were essential since virtually everything had to be portable. Indians might fish in the early spring during the spawning runs, then move to the coast to fish nonspawning fish later that spring and then they would hunt birds and pick berries until a harvest in the late summer. In the winter months the Indians would split into smaller groups to hunt. There were differences in patterns between the Indian tribes based off of which region they were concentrated in, but the bottom line was that the Indians moved to wherever the food was most abundant. The Europeans often criticized the Indian way of life. They failed to understand why the Indians willingly went hungry during the winter months when they knew food scarcity was impending. The settlers were impressed by the frequent burnings the Indians performed in the forest, which allowed for better hunting grounds and planting fields. However, the settlers criticized the division of labor between the Indian males and females. The Indian females did most of the farming, which was the man’s job in Europe. Instead, the Indian males hunted. To the Europeans, hunting was only for sport, as they did not have abundant wild animals in England with the exception of private properties of the wealthy elite. For this reason the settlers saw Indian males as lazy. These differences in habits stemmed from a difference in the origins and the values between the two groups. The Europeans practiced land ownership, while most Indians believed merely in territorial rights. To the Indians, people owned what they made with their own hands. Agricultural fields, gathering areas, and fishing sites could be “owned”, but unique patterns were formed for the hunting of different animals. The settlers were either granted their land by the crown, or they purchased it from the natives. This very act by the crown of granting land with no consideration of prior ownership demonstrates both the views of Europeans towards land-use and their disregard for the Indians claims to it. Instead of the seasonal migration that the Indians practiced, European settlers strove to “improve” the land. This meant a greater use of agriculture than the Indians. The use of livestock such as cattle, hogs, and sheep to the environment was also introduced. Indeed, “domesticated grazing mammals—and the tool which they made possible, the plow—were arguably the single most distinguishing characteristic of European agricultural practices. The Europeans destroyed large swaths of forest in order to provide space for crops and pasture. Girdling was one method used, while simple cut and burn methods were also practiced. The native grasses were not very conducive for pasturing, which led to further trees being cut down. Forests were used for fences, ship’s masts, potash, and fuel. Deforestation killed Indian hunting grounds, forever changing their way of life. According to Cronon, “the ecological effects of this regional deforestation were profound, extending even to the climate itself” (Cronon 122). Deforestation altered microclimates, hydrology, and soil mechanics. Swamps developed in previously dry places, promoting disease in those areas. Trade had a profound affect on the area, forcing Indians to put prices on certain items for the first time. Europeans traded wampum from the Long Island Sound up into New England in exchange for products such as furs. Indian economies were now tied to international markets, and they had an incentive to produce more than just self-sufficient numbers of products. Technology also made hunting increasingly easier. Animal populations in New England were strained, and in several instances were overhunted. The fur trade in the north dried up by the end of the 17th century, and even the deer populations were diminishing. As trade goods dried up, Indians were forced to give up their only remaining commodity—land. The introduction of European livestock had important ecological consequences for New England. Colonists often released hogs into the wild, where they were able to fend for themselves and reproduce wildly. They became “weed” creatures in the sense that their population began to bother both Indians and colonists alike. They invaded and destroyed fields and oyster beds, while also providing additional prey to the growing wolf population. Cattle and sheep put extreme pressures on local pastures, allowing the introduction of hardier European grasses and weeds. Soil compaction led to a less hospitable environment for plant life and eventually lowered the soil’s carrying capacity for water. By far the most dangerous organisms that the Europeans carried to America were diseases. The first recorded epidemic in New England took place in the south in 1616. Depopulation promoted conditions of turmoil while also justifying the European seizure of Indian lands. As the Indian populations diminished, edges returned to the forest, further harming the local animal populations. Attacks by colonists and intertribal warfare concentrated Indians into denser, more permanent settlements, which promoted the spread of disease. Invasions by European animals required that the Indians build fences to protect their crops. Now living in permanent, fenced-in, and densely populated settlements, the Indian way of life was more similar to that of Europe than to their original way of life. In conclusion, in less than a century the ecosystems of New England had become irreparably changed, forever altering the Native American way of life. William Cronon, Changes in the Land: Indians, Colonists, and the Ecology of New England. New York: Hill and Wang, 2003. William Cronon PBS "National Parks"